Neem leaves are medium to large in size and elongated to oblong in shape, averaging 20-40 centimeters in length. The vibrant green leaves are smooth and glossy with sharp, serrated edges. Neem leaves grow on the branches of neem trees in groups of two, and each branch produces around eight groupings. Neem leaves are extremely bitter and have a grassy taste and aroma when torn. Neem trees also grow white, fragrant flowers and yellow, olive-like fruit that has a bittersweet pulp. Neem leaves are available year-round. Neem leaves, botanically classified as Azadirachta indica, grow on a tree that belongs to the Meliaceae, or mahogany family. Also known as Indian Lilac and Neem Ke Patte in Hindi, the word neem originated from the Sanskrit word, nimba, which means good health. Neem leaves are used most prominently in Ayurvedic medicine as a cure-all herb and are used to help reduce symptoms of inflammatory, viral, and fungal infections. Neem leaves are found in over thirty countries where they are also used for timber, medicine, and in beauty products. All parts of the tree are used including roots, bark, fruit, flowers, seeds, and leaves. Neem leaves contain flavonoids which are known to have antibacterial and antifungal properties and contain azadirachtin, which is a natural insect repellent. Oil extracted from neem seeds and leaves also have anti-inflammatory properties that can help with skin conditions such as acne. Neem leaves can be used in both raw and cooked applications such as frying or boiling. The taste of Neem leaves is so bitter that they are used sparingly in culinary applications. Neem leaves are often cooked into curry-based dishes, used in tomato and fish pastes, or even pickled for extended use. In Bengal, young Neem leaves are cooked with eggplant in an appetizer called nim begun. In Myanmar, Neem leaves are used in salads. Neem leaves pair well with sweet potatoes, mustard seeds, turmeric, red chiles, roasted peanuts, tamarind, and rice. Neem leaves will keep up to one week when stored fresh in the refrigerator. They can also be frozen and will keep for a couple of months. In India, the neem tree is sacred and is linked to many Hindu festivals. There is a legend that states that planting at least three neem trees in one’s lifetime will help pave the way to heaven. In Tamil Nadu, it is also common to use Neem leaves and flowers as decorations during celebratory events like weddings and to adorn statues in temples during the Mariamman festival. In addition to ornamental use, Neem leaves have been used in traditional Ayurvedic medicine since ancient times. Neem leaves are used in baths, decocted into teas, and dried and ground to help reduce fevers, boost immunity, and reduce symptoms of malaria and dengue fever. Neem has also been studied since the 1920s for its usefulness as a natural insect repellent and pesticide. Food baskets are often lined with Neem leaves in India to repel hungry pests. Neem trees are native to India and grow widely across the country. Excavations of ancient sites in northwestern and western India have unearthed therapeutic compounds, including Neem leaves, and neem was first documented in texts from the Siddha medicinal system over 4,500 years ago. Neem then spread to China during the time of Lao Tze in the 4th century BCE, and from the 1700s to the 1900s, neem was spread to countries across the world with settling Indian families. 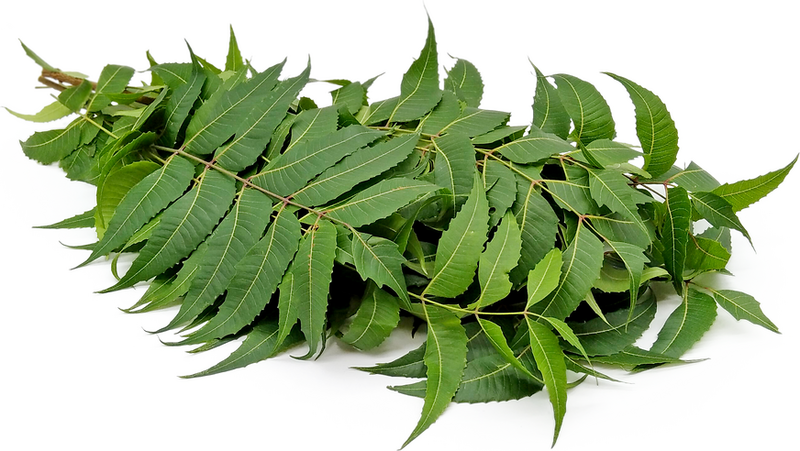 Today Neem leaves can be found in specialty stores and markets in Australia, Africa, Southeast Asia, South America, China, the Middle East, Nepal, Pakistan, Sri Lanka and the Maldives. Recipes that include Neem Leaves. One is easiest, three is harder.